For 45 minutes this game wasn’t going well. City had performed very sluggishly, and had barely created a chance against Coventry – only a Charlie Wyke header, which hit the post, and a Romain Vincelot drive from distance had threatened the Coventry goal. At the other end, Coventry had sporadic chances, with Beavon’s overhead kick narrowly wide. Alex Gilliead had limped off and Alex Jones, playing right wing, had been anonymous. It was a big half time break for McCall. The half time scores were not in City’s favour, the first half display had been poor and he was lacking options to change things from the bench after Gilliead’s injury. And this is where, in his first spell in charge, McCall’s teams might have crumbled or just faded. I remember a game at Chester in 2009 where, after a similarly poor first half, it ended up as a 0-0. This game was showing similar signs. But McCall is a different manager this time, and his team is tougher. At the start of the second half he shuffled the team around, moving Mark Marshall wide on the right, Jordy Hiwula to the left and Jones up front with Charlie Wyke, and City immediately looked a bit better. They earned a corner early in the second half, Tony McMahon swung it in and Alex Jones drilled it into the net. Goals change games, and the value of a finisher like Jones was shown in the immediate aftermath. The Bantams seemed to grow in confidence while Coventry folded. Jones had a shot tipped over, and from the resulting corner Vincelot’s header flicked the bar. City continued to charge forwards and another move released Marshall on the right. He played the ball into Jones who held it up well and released it for Hiwula cutting in from the left. Hiwula’s finish was accurate and, with the assistance of some dodgy goalkeeping, doubled City’s lead. Coventry, to their credit, tried to rally, but found a City defence in good form. Rory McArdle in particular was excellent, heading everything away while Nathaniel Knight-Percival mopped up after him. James Meredith also did well, dealing with Coventry’s tricky substitute Jodi Jones, and the hosts only had one decent chance in the half. The Bantams looked the most likely to get another goal, with Marshall threatening and Josh Cullen controlling things in the middle. The only major worry came when Alex Jones limped off midway through the half, but Billy Clarke came in and did a good job, forcing another save from a free kick. City now have strength in depth up front, ending the game without Law, Gilliead or Jones but still looking impressive, and are now only two points off second place. They’ll need more professional performances like the second half to challenge for the automatic spots, but they have a huge chance of making it. How the hell did you post that so quickly Tim. Hats off! Tuesday’s going to be interesting now. It would take a hell of a run for us to get second from here and we would probably need Fleetwood and Bolton to have a few defeats too. Someone told me today that the lowest points total in recent years for second is 83, although I’m not sure if that’s true? 21 points from nine games would mean seven wins and two defeats or six wins and three draws. Possible but probably unrealistic. 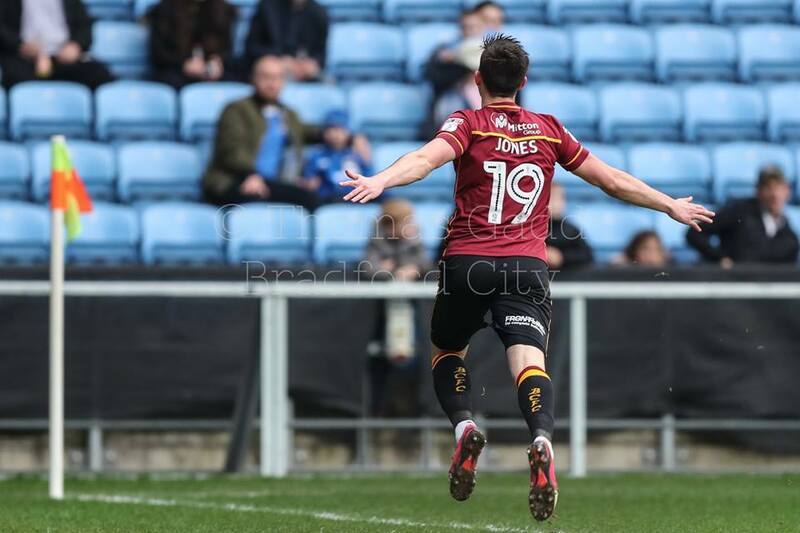 Did you not read the bit which said Jordy Hiwula to the left and Jones up front with Charlie Wyke, and City immediately looked a bit better, and also Goals change games, and the value of a finisher like Jones was shown in the immediate aftermath. Jones did only play for the last 11 minutes of the first half and although it was only a short period of time, he was anonymous in those 11 minutes. In defence of the author, I don’t think that there is a witch hunt on their part against Jones. As stated in this article, Jones was more involved in the game in the second half before he went off injured. Cullen and Marshall played well however McArdle was my man of the match.